The Dow just made another all-time record high. 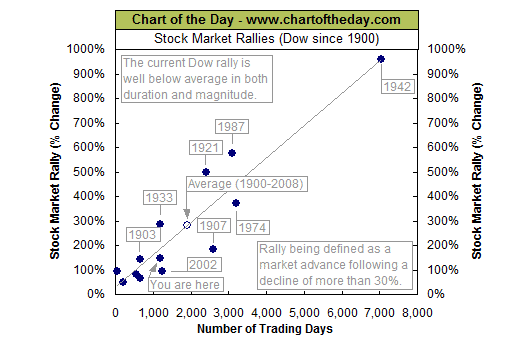 To provide some further perspective to the current Dow rally, all major market rallies of the last 113 years are plotted on today’s chart. Each dot represents a major stock market rally as measured by the Dow with the majority of rallies referred to by a label which states the year in which the rally began. For today’s chart, a rally is being defined as an advance that follows a 30% decline (i.e. a major bear market). As today’s chart illustrates, the Dow has begun a major rally 13 times over the past 113 years which equates to an average of one rally every 8.7 years. It is also interesting to note that the duration and magnitude of each rally correlated fairly well with the linear regression line (gray upward sloping line). As it stands right now, the current Dow rally that began in March 2009 (blue dot labeled you are here) would be classified as well below average in both duration and magnitude. However, the magnitude of the current post-financial crisis rally has now reached median status — its magnitude is greater than six and less than six Dow rallies since 1900. Source: Chart of the Day. The Battle 4 Atlantis Men's College Basketball Tournament broadcast on NBC Sports and AXS TV live from The Bahamas starting at 3:30 pm ET | 12:30 pm PT on Thanksgiving, November 28. Watch a promotional video here.